New research carried out by RED C on behalf of bonkers.ie shows that less than half of Irish adults have high confidence at managing their personal finances. Are you highly confident at managing your personal finances? If you're like the majority of Irish adults then the answer is probably NO. That's because recent research carried out by RED C on behalf of bonkers.ie has revealed that less than half of Irish adults are very confident at managing their personal finances. The research, which surveyed just over 1,000 adults (+18) in the Republic Ireland, showed that only 46% of the population say they are ‘very confident’ they have the right skills and information to manage their personal finances effectively. Males (50%) consider themselves more confident at managing their finances than females (43%). Younger adults (25-44) are less confident at managing their finances than older adults, with only 40% of respondents in this age group saying they are “very confident” they have the right skills and information to manage their personal finances effectively. Users of price comparison websites are more confident they have the right information to manage their personal finances. Confidence to manage finances amongst users of price comparison sites is 52% versus 38% amongst those who don’t. A current account (84%), electricity (82%), broadband/TV (78%), motor insurance (73%) and a savings account (59%), are the banking and household utilities that people are most likely to have and pay for personally. 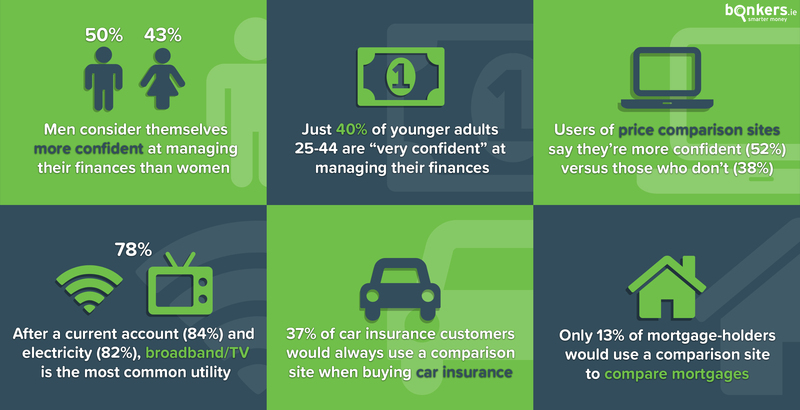 37% of those with private motor insurance would always use a price comparison website to help with buying motor insurance, while 28% of those with home insurance and 27% of those with health insurance would do so. However, only 13% of Irish adults with a mortgage said they would always use a price comparison website for help with getting a mortgage, and this fell to 11% for those with a personal loan, and only 6% for those with a current account. “It’s clear from the research that many people struggle with managing their personal finances with confidence. However with energy costs, insurance and other household bills all on the rise, it’s more important than ever that people know how to manage their money effectively in order to get the best value. As a result, we feel more needs to be done at an educational level to ensure young adults leave school equipped with the right skills and information to properly manage their personal finances. In light of this bonkers.ie calls on the The Minister for Education and Skills, Joe McHugh, to ensure personal finance becomes a core part of the Leaving Cert curriculum so that everyone has the right skills and information to manage their finances with confidence”. Perhaps, unsurprisingly, users of price comparison websites said they were more confident at managing their finances than non-users. Comparison sites like bonkers.ie can be a great source of information for consumers as they allow people to quickly and easily compare products, prices and features across a range of banking, energy and other household bills to ensure they’re getting the very best deal and value for their money. However, at 13%, the number of people with a mortgage who said they would use a price comparison site for help with their mortgage is incredibly low for what’s likely to be your largest household bill for many years. Are you confident at managing your personal finances? How do you feel about managing your personal finances? Are you confident you've all the tools and information you need? Comment below or Tweet us your thoughts @bonkers_ie. We’d love to hear your perspective!